Bowali Information Centre Near the corner of the Kakadu and Arnhem Hwys. Phone 08 8938 1121 or 08 8938 1100. Open daily 8am to 5pm. It has several displays and an excellent audiovisual display on the hour in a small theatre. 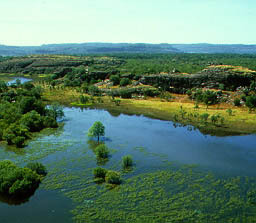 There are 2 hour for $27 and 1 1/2 boat cruises for $23 on the Yellow Water Billabong wetlands (pictured above). This is considered the highlight of a trip to Kakadu. The bird life is most active at early morning. This is the best time to take a cruise. Book the day before at Cooinda, 2km away. Phone 08 8979 0111. There is petrol available at Cooinda. u u Gagadju Lodge Cooinda Phone 08 8979 0145. 48 units accommodating up to three each for $110 per night . Pool, BBQ, bistro, restaurant. There is budget accommodation in twin rooms in mobile huts like the ones found on building sites. They are air-conditioned, comfortable and cost $19 per person. This escarpment has most impressive Aboriginal rock paintings. 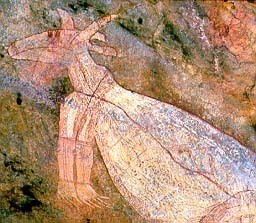 The main gallery has a 15 metre frieze of X-ray style paintings depicting animals, birds and fish. The road is sealed and is 44km north of the information centre. Nearby on the Arnhem Hwy is the Border Store. It sells supplies, food and petrol. Open till 5pm. Here on this escarpment the Anbangbang Gallery has excellent Aboriginal rock paintings. This Aboriginal town is actually just east beyond the national park in Arnhem Land. It is worth visiting for the Injalak Arts & Crafts Centre of Aboriginal artefacts, bark paintings, didgeridoos and weaving. They are high quality and are sold at very reasonable prices. It is a shopfront and workshop. You buy direct from the artists and craftspeople and can be sure the product is genuine. The centre is open 9am to 5pm daily. Phone 08 8979 0190. 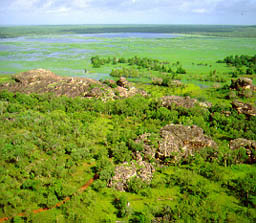 As Arnhem Land is Aboriginal land permits are required. These are issued on the spot at the northern Land Council office (phone 08 8979 2410) at the Jabiru shopping centre. Jabiru town was originally built as accommodation for workers at the nearby uranium mine. Kakadu Parklink (phone 08 8979 2411) runs tours of the Ranger Uranium Mine 6km away three times daily. $10. u u u Gagadju Crocodile Hotel is designed in the shape of a crocodile but only realise this from the air. Phone 1800 808 123 or 08 8979 2800. 110 units. Double $142, triple $162.. Pool, lounge, laundry, BBQ, restaurant. 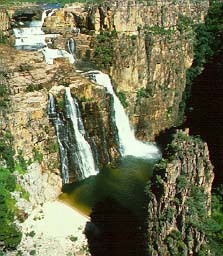 Frontier Kakadu Lodge Phone 08 8979 2422. Four bed rooms for $25 per person. Pool, BBQ, bistro. Near here the Arnhem Hwy crosses the South Alligator River. There is a boat ramp there. Petrol is available. u u ² Kakadu Holiday Village Phone 1800 818 845 or 08 8979 1066. 138 units. Double/twin $142, double $162. Pool, laundry, spa, BBQ, tennis court, shop, restaurant, bar. Greyhound Pioneer has daily services from Darwin through Jabiru ($27), Cooinda ($33) where the bus waits 1 1/2 hours while you can go on the 1pm Yellow Waters cruise and then returns to Darwin. Phone 132030. They also have a service from Jabiru to the Border Store and back. Otherwise take an organised tour from Darwin or bring your own vehicle. Head southwest to Katherine on the Stuart Highway. Travel east in your 4WD into rugged Arnhem Land. This is Aboriginal land. Permits are required. Copyright (c) 2000 Graham Warren. Backpackers Guide to Australia (TM) is a trademark.